If you live in Phoenix, Arizona, you must, must necessarily and without hesitation be of the opinion that Tucson is, like, the worst place ever in the world always. If you live in Tucson, you must, must necessarily and without hesitation feel the same way about Phoenix. At least, this seems to be a common consensus around the cities. It seems like the one place where Tucsonians and Phoenicians could agree then is that the no-man's land in between the two must be the worst of all. About one hundred miles of desolate I-10 highway, arid desert, and no less than five Cracker Barrel restaurants separate these rival cities. 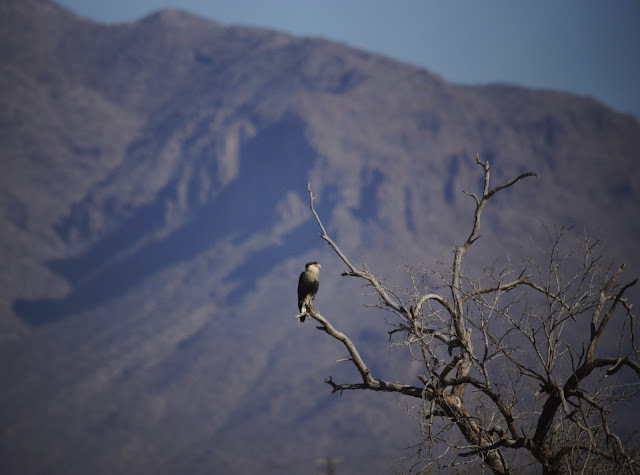 While I cannot speak directly to one or the other being better, nor the neutral ground in between being the worst of all, I can now throw my lot in with the growing crowd who recognize the Santa Cruz Flats, agricultural land in the Eloy area halfway in between Tucson and Phoenix, as having some fantastic birding! Usually one tries to pass through the I-10 stretch as quickly as possible, moving on to better, more vibrant destinations. But last weekend my express goal was to stop right in the middle and explore the flatlands west of the highway where many excellent and peculiar winter birds can be found. The are is big, flat, and dusty. The best birding is done from the car (Laziness Level = Expert! 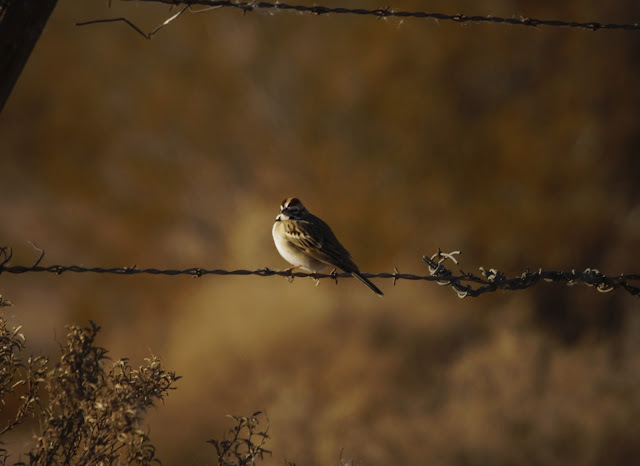 ), driving slowly along the irrigation channels and dusty backroads, seeing who's popping up from the scrub grasses or hanging out on the telephone poles. Like any fantastic day of birding, this one started with some perching Sparrows. 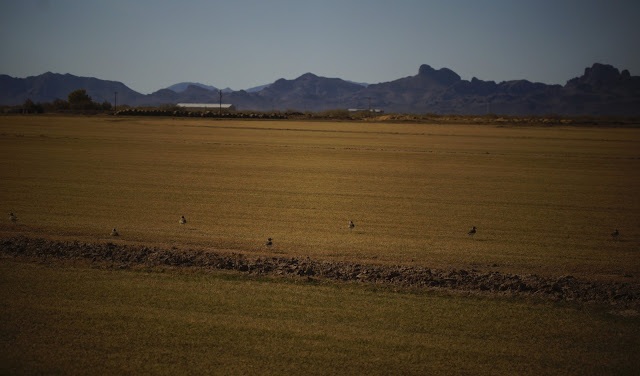 The best birding is done west of the I-10 and the Picacho Peak exit, by taking the Picacho Highway Road down to down Pretzer and Baumgartner roads, which lead farther west into various agricultural fields that play host to a number of cool birds. My first route for the day took me along Baumgartner Road, which eventually loops back around a cattle ranch that attracts Crested Caracaras each winter. With the lovely Picacho Peak adding to the unspoiled desert scenery (unspoiled provided you're driving away from the I-10), it's a nice drive. 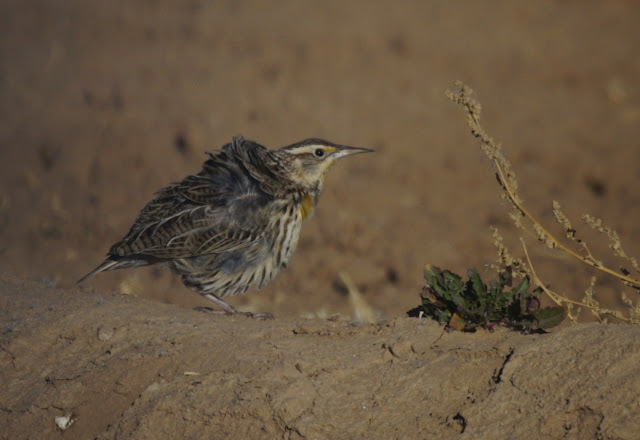 Along the way I stopped to observe some flocks of chilly Meadowlarks and inquisitive Horned Larks. Before I reached the Baumgartner cattle ranch, I passed some industrial-sized lawnmowers doing what they do best. The noise and dust stirred up by these machines seemed onerous at first, but many birds queue off of these combines, ready to scavenge whatever they stir up in their wake. In fact, Jeremy Medina was in a great position to capitalize off of this interesting system here last year. 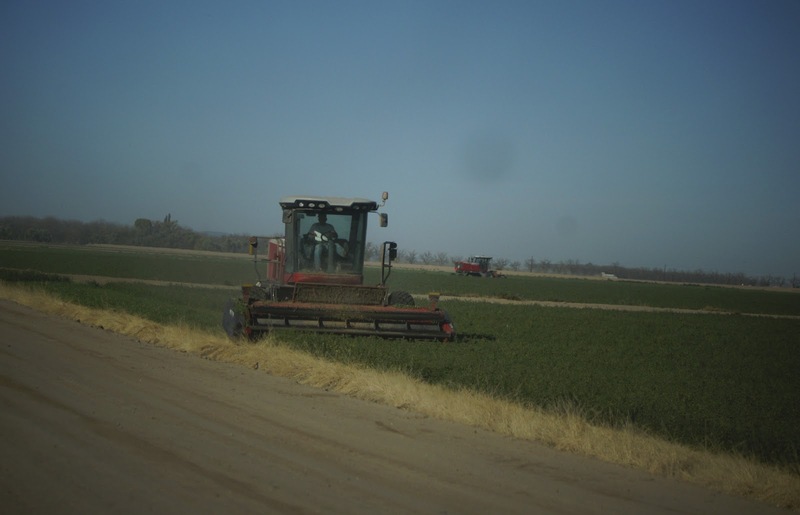 I paused my drive to both marvel at modern agriculture and observe the birds in tow. Lots of Ravens followed after the tractors, and then I spotted one large bird that was flashing way too much white as it flew by. 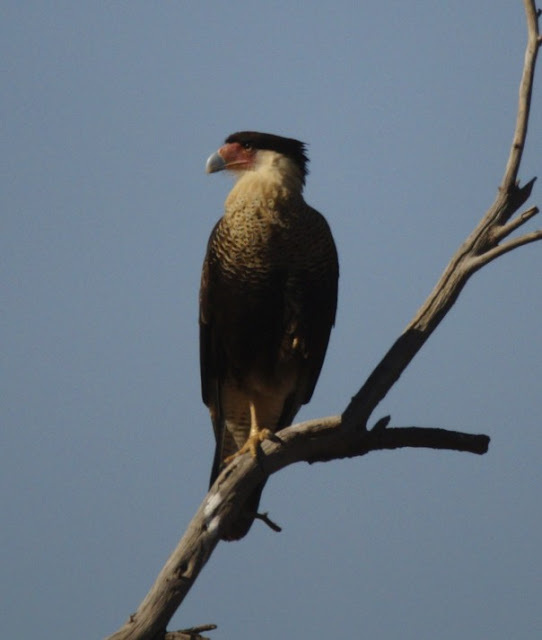 Even at a distance, the Crested Caracara is a conspicuous bird. The white neck and rump, along with the orange face, are diagnostic from afar. My heart was pounding now as this new life bird entered the arena. Alas, it did not stop, and I knew that some further effort would be required to get the really good looks that such a cool life bird demand. As I re-calibrated my sights and put my super sweet on-laon Swarovski nocs' to good use, I started to pick out the Caracara silhouettes from the scraggily trees, expanses of fenced off private property, and impassable drainage ditches that separated me from my quarry. They looked pretty cool with the western slope of Picacho Peak in the background. Like a drunken (or sober) bumblebee, I started weaving and zigzagging down dirt roads and dirt that once was a roads, trying to circumvent the fenced off areas and get a better vantage point. The Caracaras were congregating in the trees east of a large cattle corral, and I knew that eventually combining the right combination of turns and twists through the agricultural side-roads would bring me around to their nearer side. 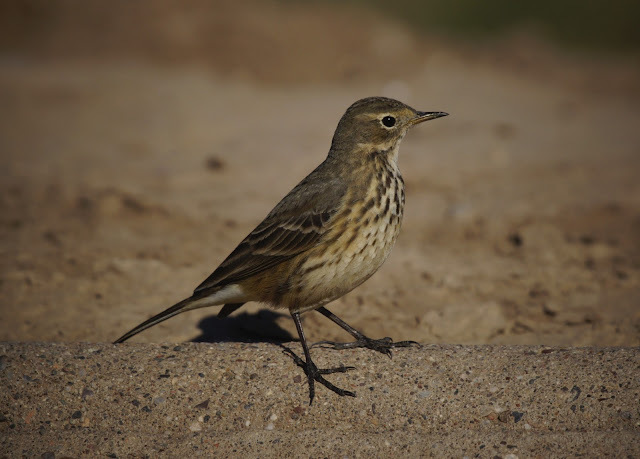 Along the way I was investigated by this brazen American Pipit, who no doubt resented all the attention the Caracaras were getting and decided to remind me that the little brown birds are cool too. 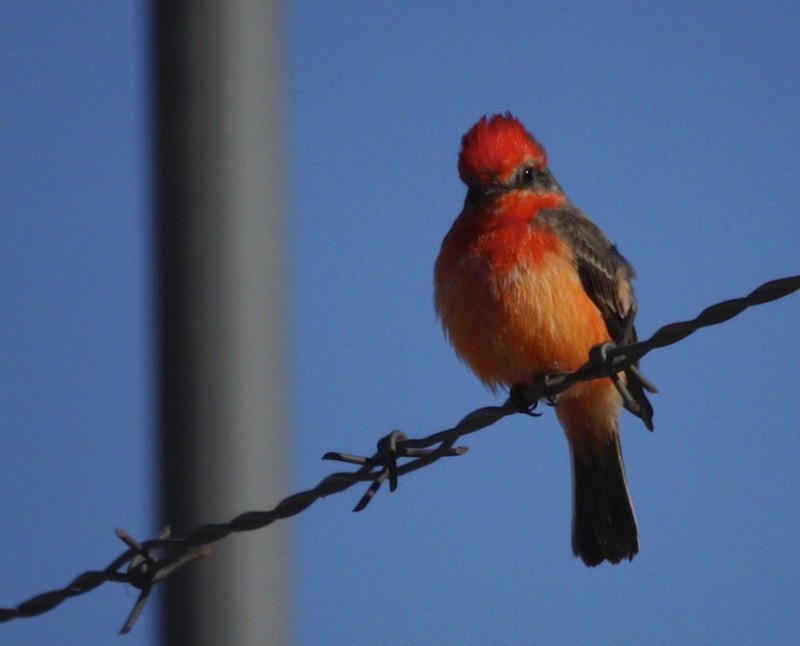 I also had a pleasant encounter with a first year Vermillion Flycatcher, who had not quite molted into his full adult plumage, but was still pretty proud of his progress and thus wanted to show off. He perched and preened on an irrigation flow-regulating gate on the southeast corner of Baumgartner, which I took to be a good omen as I swung around after the Vultures. The vast spaces out on the Santa Cruz flats put me in a different state of mind. I wasn't expecting to see many Flycatchers of really Songbirds of any kind other than the roadside Sparrows and Larks, but this Vermillion was one of three or four conspicuously perched along the road. Bonus points! Eventually I made it around to the Caracara's east side. By the time I was in a better position, many of the birds had left and the sun had shifted on me (well, ok, the earth had shifted relative to the sun), but a few still remained and I took some more satisfactory shots of this awesome bird, here at the northernmost tip of its usual North American range. You know it's a good site when Crested Caracaras are only half of the main attraction. The arid, fallow sod fields in the Santa Cruz flats are also famous for their small but stable community of wintering Mountain Plovers. This near-threatened species has small population pockets throughout the American west, but the Santa Cruz Flats probably provide the most consistent sightings. 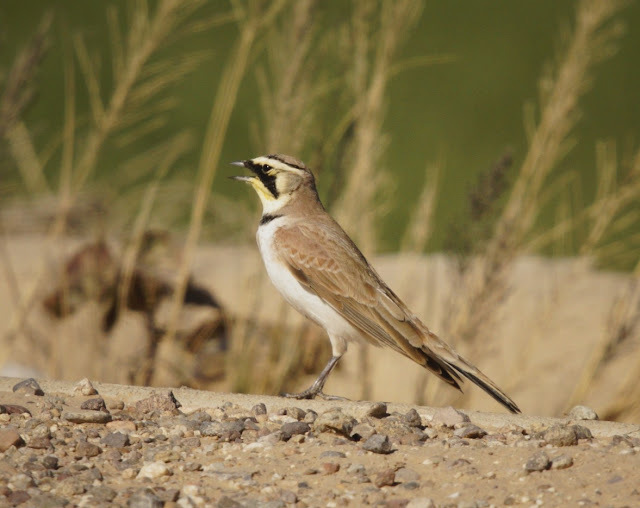 The Plovers are not the only birds who flock to these flatlands. Legions of Grackles and Cowbirds graze ahead of the pivot irrigation systems in the area. The expanse really is a sight to see. The Mountain Plovers actually do not prefer these lusher areas. I mostly hung out here just so the crawling irrigation tracks would give me a free carwash, which would've worked brilliantly if it weren't also a dusty drive back home. Net cleanliness gain= zero. The Mountain Plovers like the spiky, dry, crunchy fields that are taking the year off. Since the sod farms rotate their fields every season, this means there's always some un-sewn land available for the Plovers. Nonetheless, I wasn't overly optimistic about finding them. It was still early in the season and I wasn't very familiar with the area. There is a lot of open space too, so the odds seemed stacked against me. But heading west down Pretzer road, past Tweedy Rd and turning onto Rd. 2750, I found some promising sod. 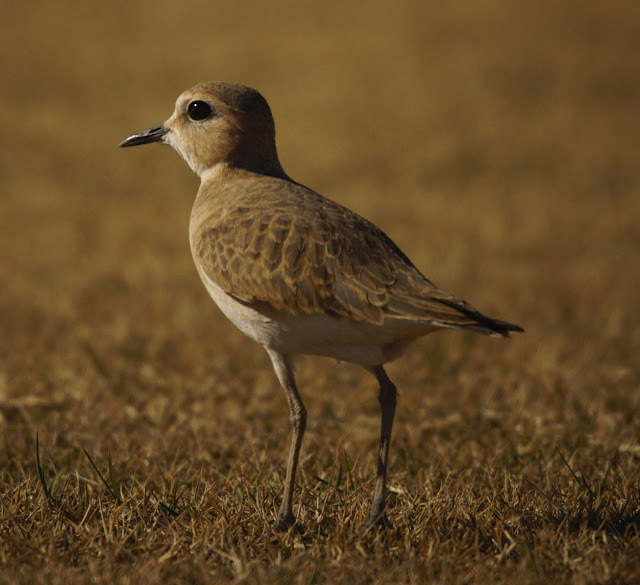 Sure enough, the plump and dainty silhouettes of the Mountain Plovers stuck out from the golden fields, and I counted twenty-six of these birds along one furrow. They liked to cozy up in the extra cover afforded by old harrowers tracks, contented to wait out the winter and maybe stroll around devouring bugs when it suited their fancy. It is a life of luxury for sure. The younger-looking (1st year?) birds were more adventurous. I got out of my car and lay down in the dry grass, which felt like I was laying on cactus prickers. That discomfort was soon pushed to the back of my mind though as the birds actually seemed just as curious about me, and approached very closely. Unsurprisingly, they found me to be quite boring and largely inedible. It was very gratifying to see that I was not perceived as threatening, and that the birds did not mind the little photo-op in the slightest. 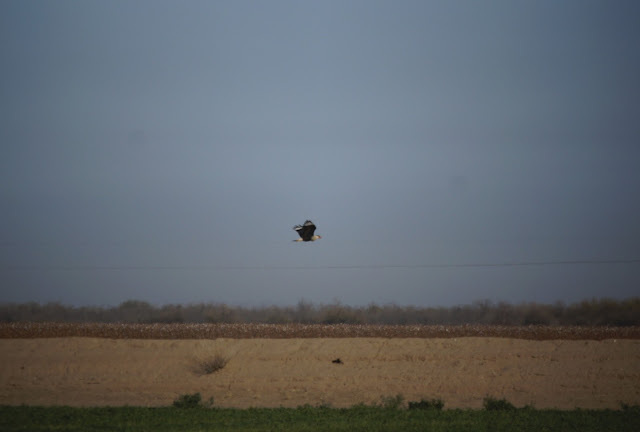 In fact, they were much more concerned with the Northern Harriers that would buzz by from time to time. 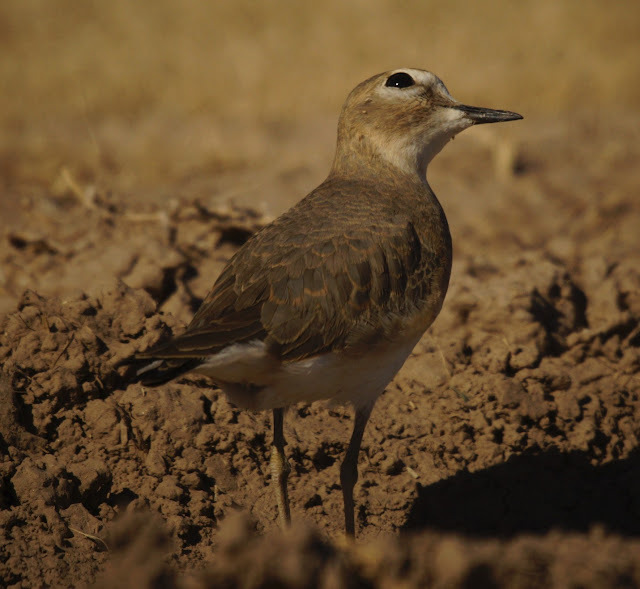 Finding the Mountain Plovers and being close to them was one of the more magical birding experiences I've had this year. Throw in some Yellow-rumped Warblers, Gila Woodpeckers, plenty of Kestrels, a Shrike or two, and it was a forty species day. The diversity around the Santa Cruz Flats it pretty good (and I was a little sad to find no White-tailed Kites or Ferruginous Hawks, which also occur in the area), and the specialties it offers are spectacular. Next time you're in the area, check it out! I'll meet ya there. 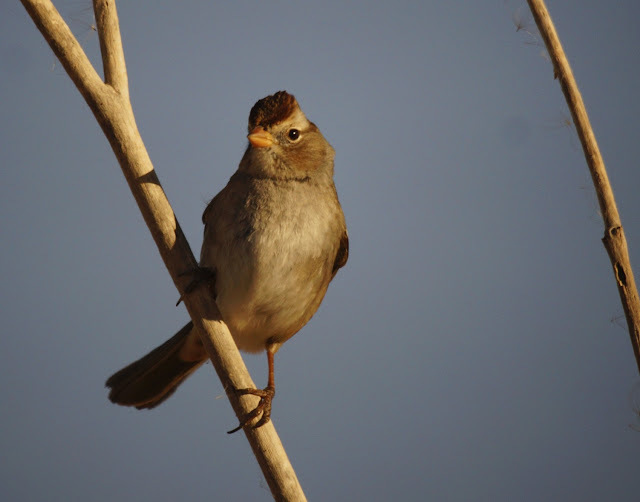 Even between the warring states of Tucson and Phoenix, in fact especially between those warring states, birding is fun. Cheers Adam, they're one in a (ver)million! Awesome adventure. Great writing. Very cool birds. A great birding by car destination. In light of recent tragedies in the news, it was nice to read something to make me smile and remember the good and beauty in the world. Anyway, now I'm outfitted to bird this area real good next time you come through! OMG, a Mountain Plover?? What a super find! What a wonderful post! I am so jealous of you! I have yet to see a mountain plover, but thanks to you I now know where to look! Glad you had such a fun day. Wonderful pictures and story! That pipet seems to be giving you the "come hither look!" I hope you get chance to go for the Plover soon. Next time you're driving up to Phoenix! So many great birds! Congrats on your lifers! The Mountain Plover is adorable; that's great that you were fast friends and able to get such excellent shots! 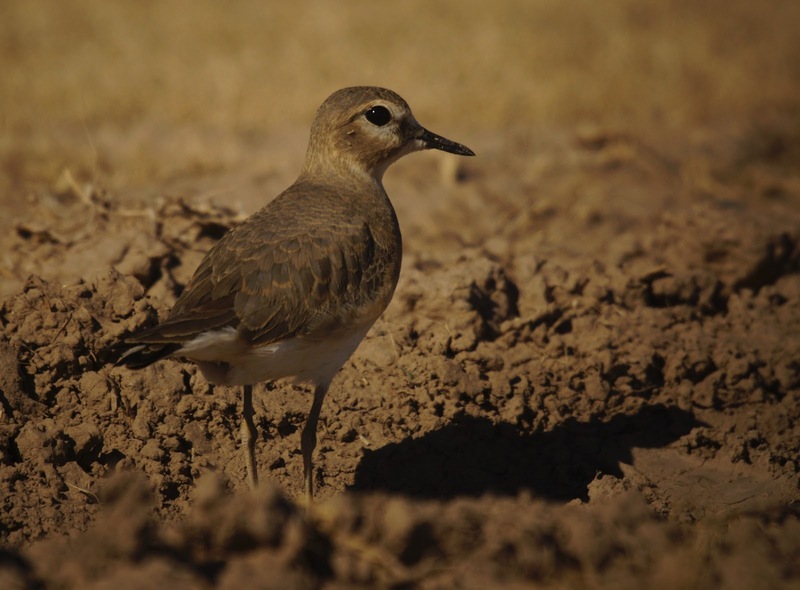 Great post and love the photos of the Mountain Plovers! A very spectacular day for you! It's not often I get good shots of a lifer the first time around. Good day indeed! I've been there several times, and got good photos of a Caracara on one occasion. I guess birding from the car makes me an expert fer shure. I hadn't thought about lying on the ground, but then I have never seen any Mountain Plovers there, either. I have seen plenty of other things. You never know what you'll see, because the landscape is constantly changing. Probably the most spectacular thing I have seen is 700 blackbirds all at once. That even raised an eyebrow or two at eBird. Be careful around Baumgardner. The woman who lives on the corner does not like birders, especially around her cattle barn. She used to. But they wore out their welcome. 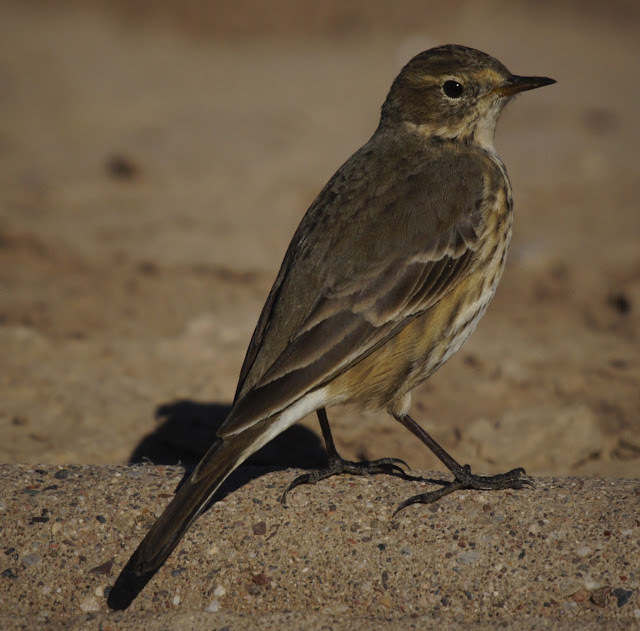 A trip back to the Flats with an experienced birder would be a welcome experience. There is some really good potential there for big birds and big groups of birds. I didn't see any flocks 700 strong, but I believe ya! It is important to be mindful of the private property there too and not compromise it while going after the birdies. If it's done right though, Santa Cruz has some great stuff! Impressive photos Laurence! That's closer than I've ever been to the caracaras and plovers, very cool. They're not always easy to find. I had to do some sleuthing for sure, and it's a big area--easy to get discombobulated. I spent enough time there to get a feel for all the rods and connections though, and I'm looking forward to another chance to bird there with others. 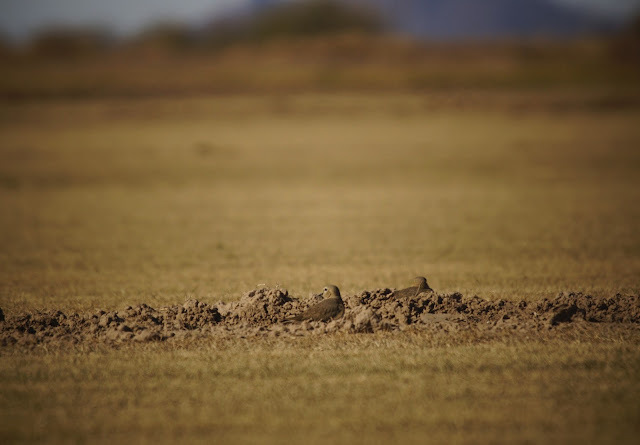 You're right to be wary of the little Plovers. The raptors didn't go extinct after all; they just shrunk down and lost their teeth...but not their bloodlust. Next time you and Kathie are heading up towards Phoenix, we'll have to meet up at Santa Cruz (and anywhere else). I feel very confident in knowing my way around this area now and I bet we'd land both of these specialties and get some good shots too! A magical trip, Laurence! Loved reading it and marveled at your brilliant pics of the Vermillion Flycatcher, the Pipit, the Caracaras, the Mountain Plover....It sounds like a birding wonderland whereas here in the northeast it's all frozen and quiet - just the occasional Chicadee - I counted all of two on my 30 min walk yesterday! But I saw all those super shots of the Pine Grosbeak too! I wouldn't mind trading a few Plover with you for some of them! A most fabulous birding adventure, Laurence! I truly enjoyed reading this delightful post. Your passion for birding shines brightly. Congratulations on the Caracara sighting. Super photographs in this post. 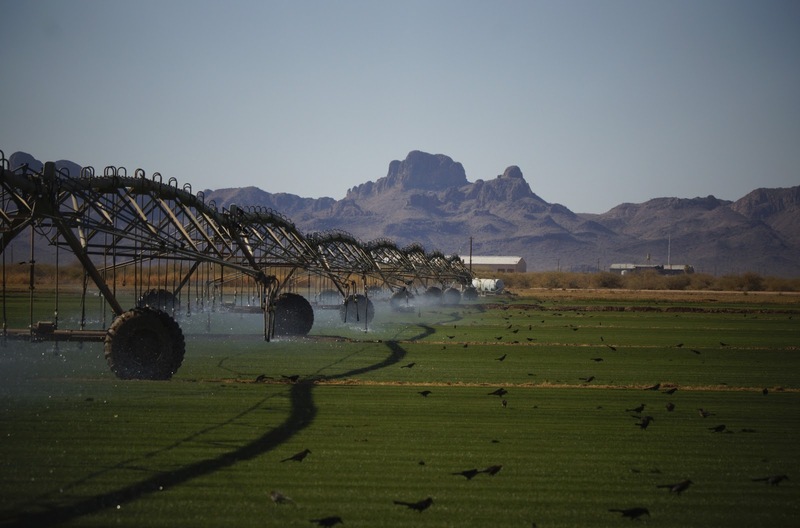 The water irrigation image with all the birds is very cool. 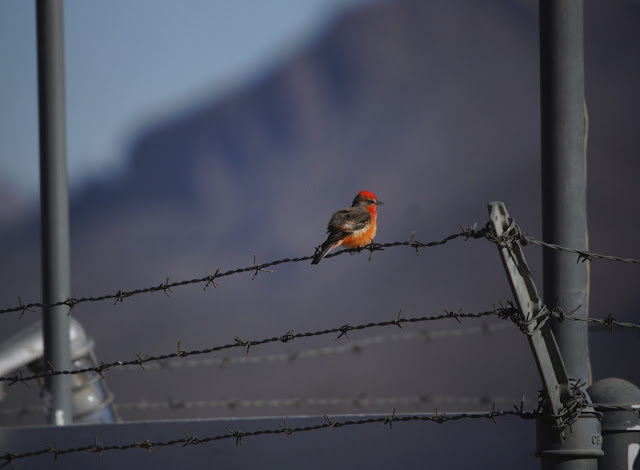 I also loved the gorgeous Vermillion Flycatcher captures. Sweet Pipit close-ups and terrific Mountain Plover shots. All GREAT! Thanks Julie G! You're a trooper for reading through the whole thing!